The Ubuntu live-usb created by ultraiso or unetbootin won’t boot due to the new image file since Ubuntu 10.10. It can be solved by replacing ‘vesamenu.c32’ file or editing ‘syslinux/syslinux.cfg’ to add “#” before “default vesamenu.c32”. There’s a program Image Writer that can create bootable Ubuntu live-usb without this problem. 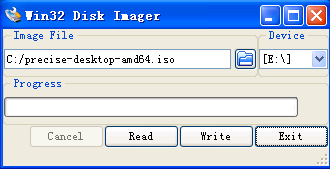 This utility is used to write Ubuntu img files to SD and USB cards. This program is an alpha, and has no warrenty. It may eat your files, call you names, or explode in a massive shower of code. The authors take no responsibility for these possible events. 2 users responded in " Create Bootable Ubuntu 12.04 Live-USB on Windows "